These awards cover 10 seasons and 34 productions. 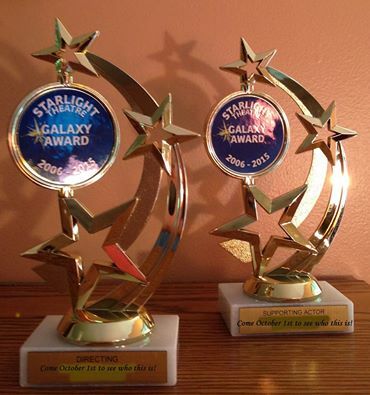 Nominations were solicited from 34 individuals who regularly attended or were involved with Starlight productions. Then a judging committee of 7 reviewed and voted on the nominations looking for level of difficulty and standard of execution. Many thanks to the diligent work of those judges: Susan DeRosa, Elizabeth Todd, Chris Klaver, Jan Ross, Cathy Wotring, Lori Arendsen and Linda Granger. Steven Edgerly – Lead Actor, Musical – I Do! I Do! Elizabeth Aylsworth – Lead Actress, Musical – I Do! I Do!